Check out these Inspection Cameras! Does your job require you to look into dark, hard to reach places? If so, you probably work in HVAC inspection, automotive repair, or aircraft inspection. An inspection camera is one of the best tools to help you do this. It’s a miniature camera on a long cord that attaches to your iPhone, iPad, or Android phone. You snake the borescope camera into the space you need to see and the images appear on your cell phone’s screen in real time. These devices have a wide variety of uses, including at least one you might not have thought of. Solid Signal is happy to share details of the endoscope cameras we carry. Checking my minnow traps without having to haul them up every 30 minutes or so. Put it underwater near my bait to see what’s nibbling on the hook before the bobber flinches. During the winter, what better way to see what’s under the ice than an inspection camera? This Wi-Fi inspection camera is one of the most popular products Solid Signal carries. It makes a wireless connection to your computer or phone, and features a rigid wire. This 6.5-foot wire keeps the shape you form it into to allow the camera to reach far back into just about every hard to see places such as vents, walls, floors, and pipes. This makes the borescope camera a favorite with plumbers, electricians, HVAC professionals, and auto repair technicians. 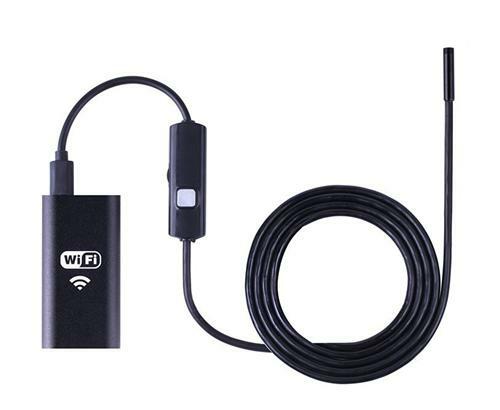 This USB inspection camera is similar to the Wi-Fi endoscope camera that we carry. The biggest difference is that this borescope camera attaches directly to your Android phone with a USB adapter. The flexible, waterproof camera is attached to a 6.5-foot cord that reaches into hard to see spaces to captures photos and video. This Android device is great for any professionals or do-it-yourselfer whose work requires them to see into hard to reach places. Do you want an endoscope camera? Some of these devices, also called endoscopes or borescope cameras, can cost upwards of $200. Solid Signal believes that you shouldn’t have to pay so much for a tool you need. We carry affordable USB endoscope cameras that attach to your iPhone, iPad, or Android phone. These devices will give you the big picture at a small cost. Solid Signal carries these devices for iPhones, iPads, and Android phones. If you have any questions about these devices, we’re happy to answer them. Just give us a call at 877.312.4547. What file format is better for digital signage?